If you're looking for a beautiful way to add large plants to your decor, then the CUBE Cottage is the perfect planter. This spacious cube-shaped container is designed for plants with bigger roots, such as lemon trees or focus plants. Plus, the CUBE Cottage's natural wicker finish allows you to seamlessly incorporate it into your home's current indoor and outdoor furnishings. 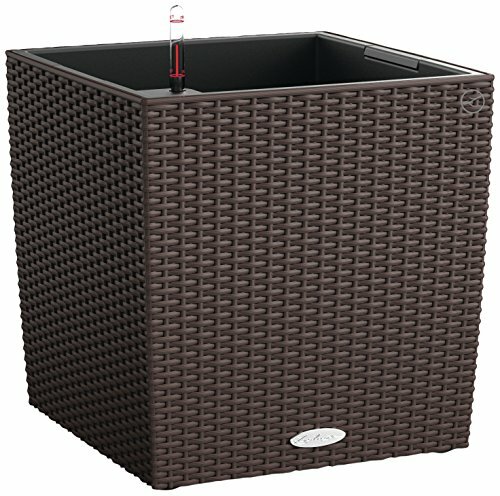 Like most LECHUZA planters, the CUBE Cottage comes equipped with an easy-to-lift liner that makes planting simple. A signature water reservoir that supplies water to your plants as needed extends time between watering. Users can easily monitor their water reservoir levels with the planter's water level indicator, which shows when the reservoir needs to be refilled. This takes the guesswork out of plant care and lets you go weeks without additional watering. (Time varies depending on planters, planter size and environment.) Also included with this planter is LECHUZA's specially-formulated plant substrate, LECHUZA-PON which separates your potting soil from the water reservoir, aerates the roots, provides your plants with nutrition and helps regulate the water supplied to your plant. As an indoor and outdoor planter, the CUBE Cottage is outfitted with a drainage plug to allow for the removal of excess rainwater when installed outdoors. This feature makes the CUBE Cottage ideal for annuals, blooming plants and foliage.